Early this weeks, our members from Germany and Denmark Diakonie Deutschland and Kirkens Korshaer were awarded by our partner the European Federation of National Organisations Working with the Homeless (FEANTSA) for their projects tackling homelessness. Our members’ representatives got the gold and silver medal at the 2018 “Ending Homelessness Awards” ceremony in Brussels, greeted by Marian Harkin MEP for their innovative homelessness projects funded by the Fund for European Aid to the Most Deprived (FEAD). The Awards are run for the second year in a row by FEANTSA in collaboration with the European Commission Directorate-General for Employment, Social Affairs and Inclusion, in order to recognise smart and sustainable uses of EU funding to fight homelessness across Europe. 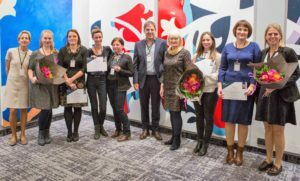 The first prize was awarded to the project “Frostschutzengel Plus” run in Berlin and jointly managed by Caritas and GEBEWO, a social enterprise run by our German member Diakonie Deutschland. The project provides a counselling service for homeless mobile German and EU citizens in a range of languages including Bulgarian, Bosnian-Serbian-Croatian, English, Lithuanian, Polish, Romanian and Russian. Service users receive advice on existing homelessness services (day centres, night shelters, GP surgeries, etc.) and are also informed of their rights. The silver medal went to the project “Vulnerable EU Migrants” run by our member Kirkens Korshær in Denmark within its service for migrants Kirkens Korshær Kompasset. The project provides outreach services for often hard-to-reach destitute EU mobile citizens who struggle to access low-threshold services. This outreach activity is accompanied by advocacy work in filing complaints and active campaigning against the increasing prohibition of sleeping in public spaces. To know more about our members’ projects, please read Diakonie Deutschland and Kirkens Korshaer project websites. To know more about the 2018 “Ending Homelessness Awards”, please visit FEANTSA website. Watch FEANTSA video about our member Diakonie Deutschland service for homeless people in Berlin!